Independence Day commemorates the United States’ declaration of independence from Great Britain. Significant events occurred in New York City during the Revolutionary War, and many historic figures were from, and are buried here. In celebration of Independence Day, CityLand has created a list of some historic landmarks designated by the Landmarks Preservation Commission that have a connection to the Revolutionary War era. Happy 4th of July from all of us here at the Center for New York City Law. New Utrecht Reformed Church, Brooklyn. Image Credit: Friends of Historic New Utrecht. The original church was founded in 1677. During the Revolutionary War the church was used by the British as a hospital, a prison, and a riding school during the British occupation following the Battle of Long Island. The British troops held target practice on the Church’s weathervane, and the headstones at the nearby cemetery. The Church’s Liberty Pole was constructed in 1783 to commemorate the British departure. The Pole has been replaced several times but has been surmounted by the same eagle. King Manor takes its name from Rufus King, a founding father of the United States. He was a framer and signer of the Constitution, one of the first senators from New York State, ambassador to Great Britain from 1796-1803 and a strong opponent of slavery. In 1805, Rufus King purchased the house and 90 acres of surrounding farmland. St. Paul’s Chapel was George Washington’s place of religious service following his inauguration as the first President in 1789. It is the oldest existing church edifice in New York. The first Trinity Church was burned in the Great Fire of 1776. The second Church was razed in 1839 because of structural weakness. 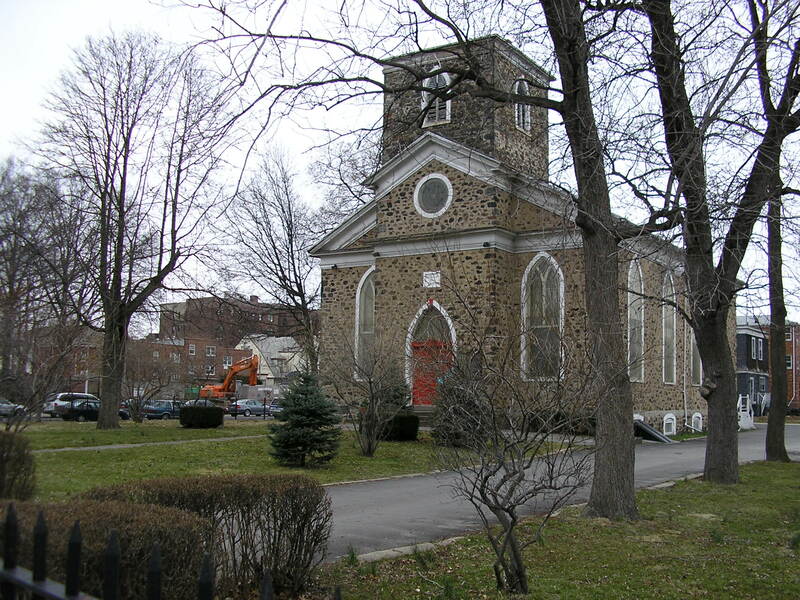 The church holds the remains of many historical persons, including Alexander Hamilton, Captain James Lawrence, Robert Fulton, Albert Gallatin, and Francis Lewis. Conference House, Staten Island. Image Credit: NYC Dept. of Parks & Recreation. 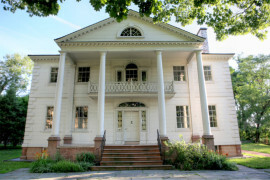 The Conference House in Staten Island is celebrated as the location of the abortive peace conference held in September 11, 1776 between Benjamin Franklin, John Adams, and Edward Rutledge, representing the America side, and Lord Richard Hewe, Admiral of the British Fleet, assisted by Henry Strachey, Hewe’s secretary, representing the British. Although the purpose of the meeting was to seek a peaceful settlement of the Revolutionary War, the efforts proved unsuccessful, as the Americans refused to renounce their demands for independence. Gouveneur Morris Jr. donated the St. Ann’s Church complex in 1840 as a family memorial. Among those whose remains are in the graveyard crypt is Lewis Morris (1726-1789). Lewis Morris was a Major General during the Revolutionary War, and a signor of the Declaration of Independence as a delegate to the Continental Congress from New York. He later served as a delegate at the New York Convention to ratify the U.S. Constitution in 1788. Morris-Jumel Mansion, Manhattan. 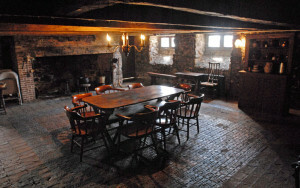 Image Credit: Morris-Jumel Mansion, Inc. The Morris-Jumel Mansion, built by Colonel Roger Morris, a loyalist sympathizer in 1765, served as headquarters for both the Americans and the British during the Revolutionary War. The mansion became the headquarters for General George Washington after the Battle of Long Island. After Washington evacuated most of the American forces from Manhattan, the British occupied New York City. The mansion then became headquarters to British General Sir Henry Clinton and later, Hessian commander Baron Wilhelm von Knyphausen. When peace was declared, the mansion and land were confiscated and sold by the Commissioners of Forfeiture. By: Brian Kaszuba, CityLand Editor and Jennifer Baek, CityLand Fellow.